Hundreds of precision shaped tread wedges. Excellent traction, wet or dry. Applications in 17.5" and 19.5" sizes. Fights irregular and excessive wear. Promotes high durability and retreadability. Excellent performance for steer axle or all wheel positions. 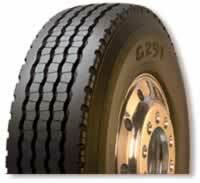 Ideal tire for metro service applications.